Interview with Mr. Sean Higgins: At the beginning of October 2015, a new Marketing Coordinator for Europe was appointed. We are so happy that he helps us to improve better. Get to know him more form this interview. Interview with Nancy Vagkoti and Pavlos Hatzigiannis: Nancy and Pavlos from Greece started building the DXN business when their country was going through the hardest economic crisis. With DXN they changed their situation and now here they are sharing their inspiring story with you! Susanna Palma Krusinszki, who translated it very well. Most of the DXN members dream about having the opportunity to visit Malaysia, DXN’s home country. In September 2015 more than 120 European DXN members could participate to the Grand Opening of the new DXN branch and office in Kuala Lumpur and visit the DXN farm. Interview with Mr. Osler Sto Tomas: Mr. Osler is a very successful business builder from the Philippines who visited Europe many times and gave many motivating presentations. DXN Spain’s 1st anniversary: The quickly growing DXN Spanish market had a very important event in September: DXN arrived to its first year in this wonderful country! We are really proud of them. Great leaders, wonderful team. The Grand Opening of the new Hungarian DXN Shop and Café – Hungary has a brand new and stylish DXN Shop where you can buy DXN products and taste DXN coffees and drinks. 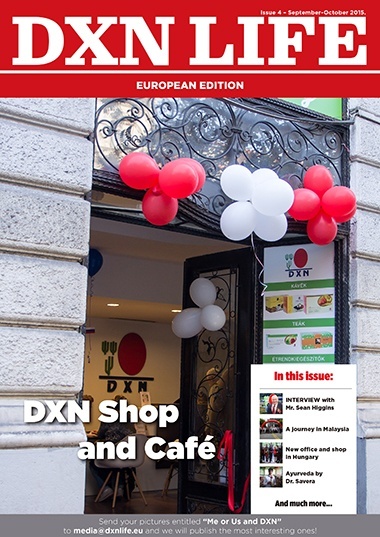 Here is our picture gallery about the new DXN Shop in Budapest. DXN and me – Great picture gallery – Can you find us? Qualified members from Europe – There are 6 new diamonds from our team with photo on the list. Congratulations! We are very proud of you!